A simple way to get your bed off the floor and have it sitting at the perfect height to easily get in and out can be as simple as setting up a metal bed frame underneath it. 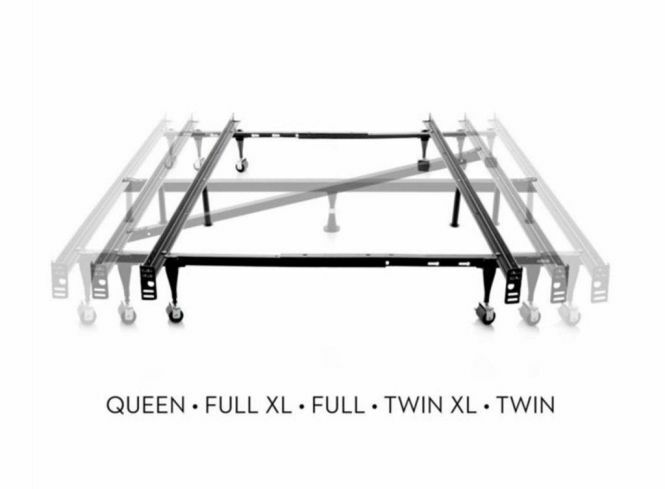 This Malouf metal bed frame is a standard queen frame that can easily adjust to a twin and full size as well and gives you 7 inches of added height and gives you a little extra storage. This frame is made of high quality steel that comes in three main pieces that interlock togetherto create a durable and solid frame for your mattress and box spring. The legs are attached with solid rivets to increase strength and there’s a glide for each foot for easy moving as well as protection on whatever surface it is on. The cross arms lock together in one of the preset size options and then are secured with a canoe clip, no tools required. There are also plastic end caps that protect the bedding and as well as brackets that you can easily attach a headboard to. When all is said and done, this frame will be about 7 inches off the ground and will create an ideal height for most people once that mattress and box spring is on. It also provides 7″ of usable storage space under the bed, if you choose. The assembly of the Malouf metal bed frame is fairly easy and the best way to explain it is to show you! Check out our video below for step by step instructions on putting this frame together. This frame is a very durable, high quality and easy to assemble and comes in at a great price point. The queen size is about $50 and is a great deal for creating a optimal space for your bedroom, an ideal height for your mattress and even extra storage underneath. Having a frame under your mattress is great for so many reasons and having a quality frame that you can depend on is even better. 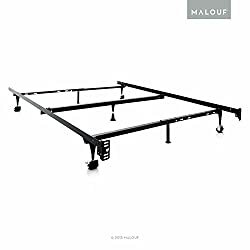 The Malouf metal bed frame is a not only easy to assemble, it is easy on the wallet and will hold up for the long haul. This has been our go to basic frame over the years and we definitely recommend this frame to others. Still looking for some more information? Please contact us and we would be happy to help you!